I’m usually a bit wary about colour. A pastel pink mug here, a pale yellow bowl there. Nothing too radical, nothing too punchy, nothing too colourful. But I had to make an exception this week, as the candy-toned Swiss chard simultaneously reached its zenith – 5ft of concentrated colour – and its last hurrah: the kale seedlings needed the space. I wanted to hold onto the colour for a little longer though, so I carefully picked off the leaves to wilt with preserved lemon for dinner, and stripped its stalks to make pickled chard stems. 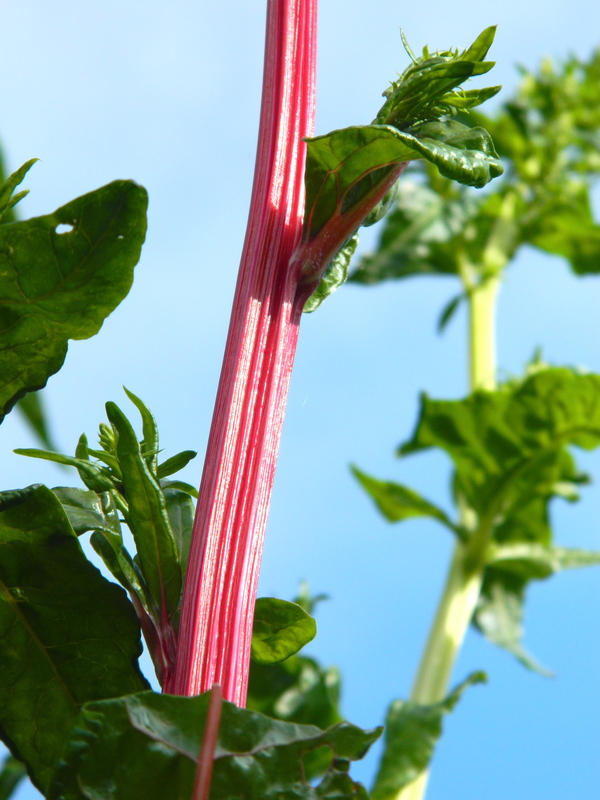 The idea behind pickling the stems was that they would be like the longed-for Lebanese turnip pickle in flavour, if not form – the beetroot that gives the turnip pickle its flavour and colour is in the same family as Swiss chard – Chenopodiaceae. These rather pretty pickles would be great chopped into salads or left whole, to be dipped into hummus alongside scrubbed new carrots and toasted pitta shards. Because Americans would pickle anything and therefore can be trusted for good pickling advice, I used a recipe from US culinary bible Bon Appétit. I made some small adjustments as I went along – I didn’t add the stipulated caraway seed, water or the shallot, for example, and I cut the amount of sugar and salt to suit. To gauge my quantities, I filled a small jar with slim, 2-inch long pieces of chard and then transferred them to a sieve for salting and draining. 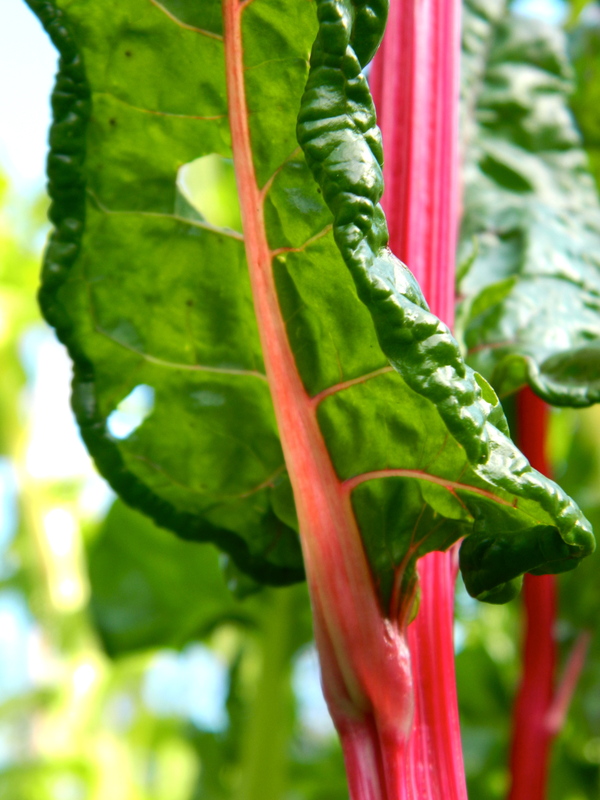 Strip the chard of leaves till you’re left with neat, straight stems. Cut into 2-inch lengths, discarding any wider, woody sections. 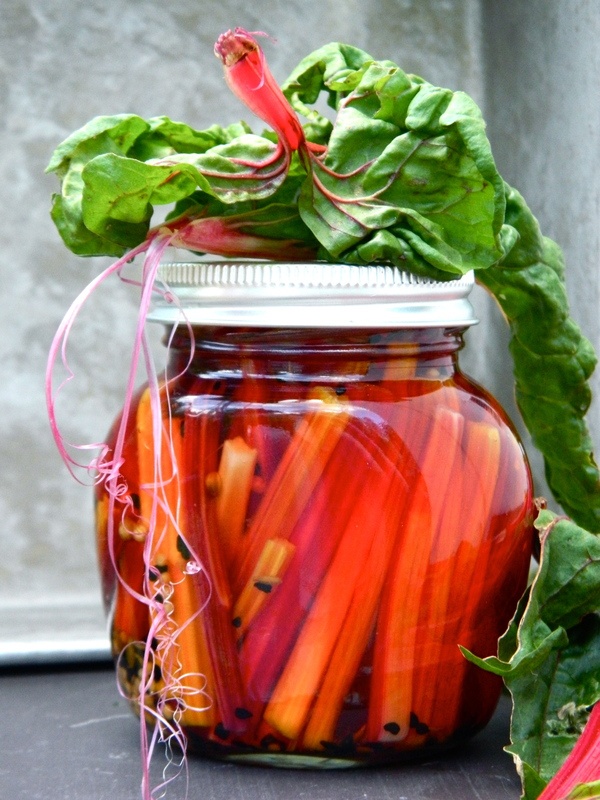 Pack them into your jar, standing them straight up, so that you know how much chard you need. 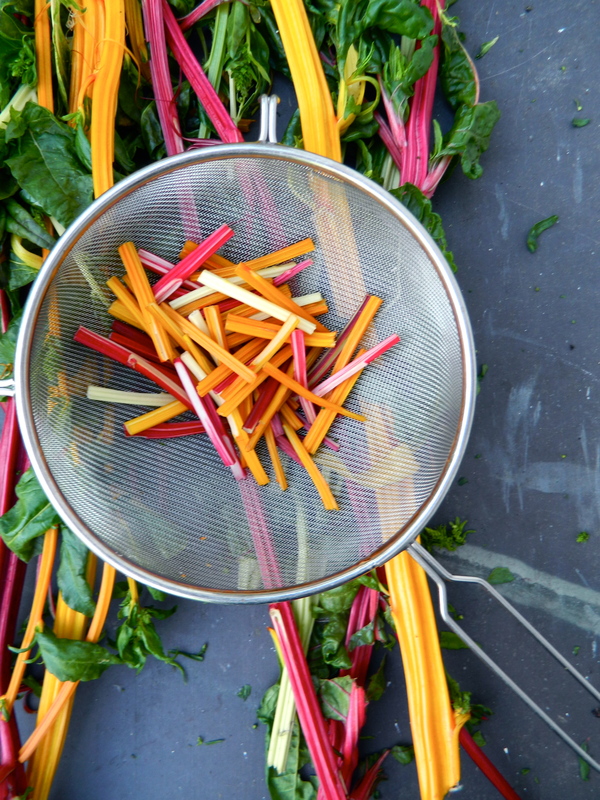 Tip the jar of Swiss chard into a sieve and shake a large pinch of salt over it. Leave to drain for half an hour then rinse thoroughly, paying special attention to the ends of the chard stems, as this is where the salt gathers. Leave to drain. Lightly toast the spices in a dry frying pan and bring the vinegar to a gentle simmer with the sugar. 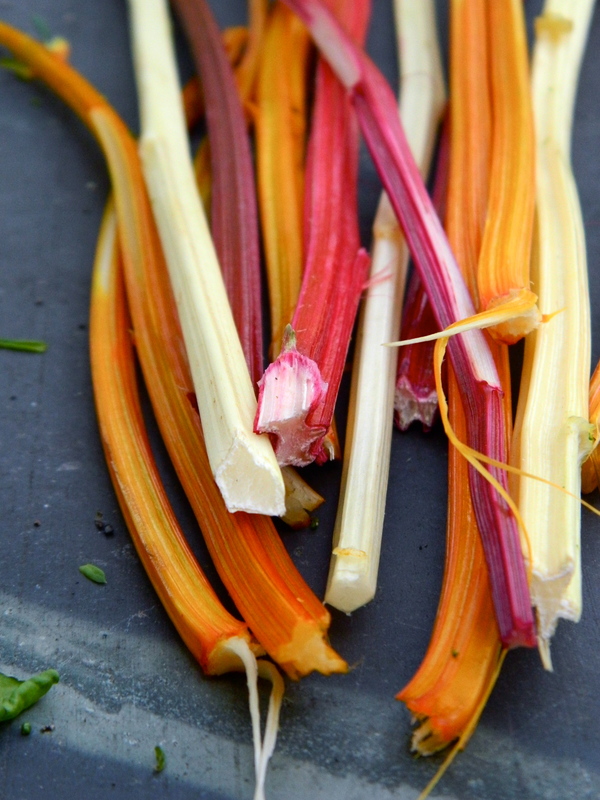 Pack the drained chard stems into the jar, sprinkle the lightly toasted seeds over the top and pour in the vinegar so that the tops of the stems are covered. Give the jar a shake so that all of the seeds are evenly distributed and refrigerate. This pickle will last for about 3 weeks in the fridge.